When hauling bulk materials, there are criteria to consider when deciding on vehicles. 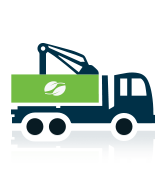 If you have a loading machine available, hire a 6 or 8-wheel tipper lorry. 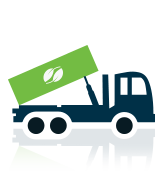 However, if more flexible access to the material is required, you’ll get that from our grab lorry. They’re suited to smaller spaces or when you don’t have a loading machine. When fully loaded, the 6-wheeler holds approx. 12 tonnes, while the 8-wheeler holds up to 16.